We need a new mattress, ours is over 10 years old and we can feel it’s age. But oh my on the journey of finding one, it’s overwhelming! There are so many options and extreme price differences that I’m more confused then ever trying to make a good choice, not just comfortable, but eco and vegan friendly too from a decent company. To make matters worse, since I started looking, my Facebook and Instagram feeds are loaded with mattress ads for brands I’ve never heard of further adding to and complicating our list of considerations. Currently the Avocado Vegan Mattress looks interesting, but pricey. And Saatva looks interesting. Heat is a big thing for me, I tend to get hot sleeping and have problems sleeping in the summer no matter how cranked the AC is, so I’m attracted to cooler mattresses. We tested Purple mattresses today which I liked, but they’re a pretty different experience from our current mattress and ugh on the prices. We’ll be continuing our journey this week, so please let me know if you have recommendations for me. It was another hot weekend of triple digit heat here and a lazier weekend since I’m on call for work. Miko has been happy to chill with us watching movies while Leela has been really enjoying her cooling bad. We had to drop hubby’s car off at the dealership for some maintenance and repairs where they had a peacock just hanging out greeting visitors to the service department, did not seem afraid of anyone and barely moved for cars pulling up. 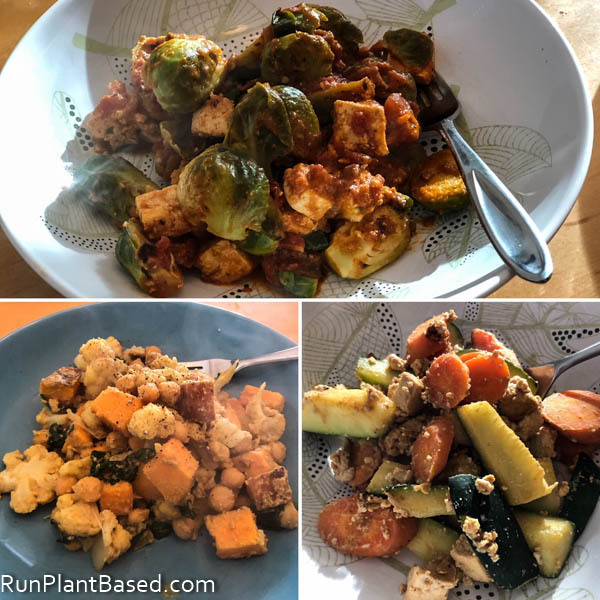 There have been a lot of simple tofu, bean, and veggie stir fries this week. 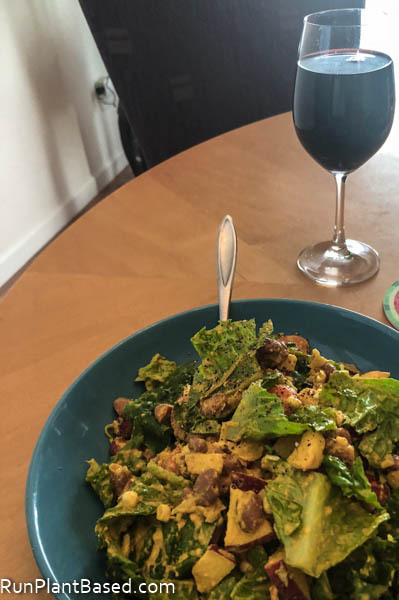 The marinara brussels sprouts with tofu was especially tasty after a busy day. And salads because facing a hot dish after a long hot day is not appealing sometimes. 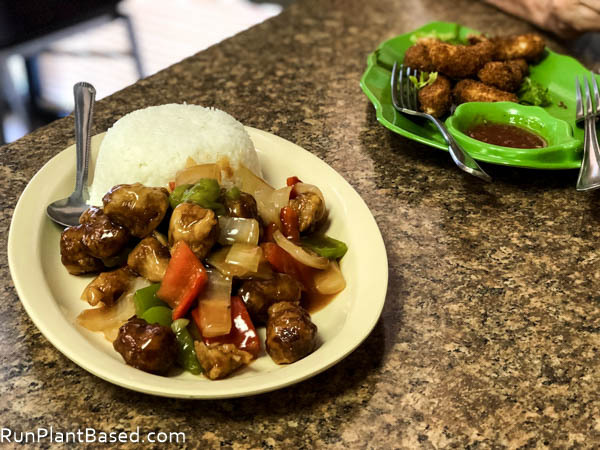 We stepped out to Pho Vegan Asian Cuisine for lunch once this week for mock orange “chicken” and vegan “shrimp”. 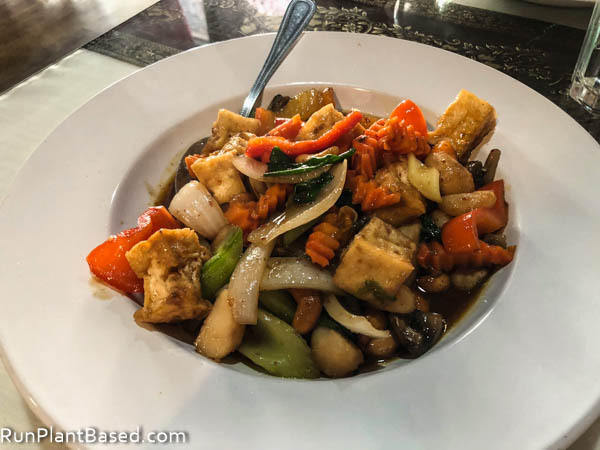 It’s been awhile since we visited out favorite local Thai restaurant with the vegan burger battle last month, so we stopped by Friday where this spicy cashew tofu dish hit the spot. 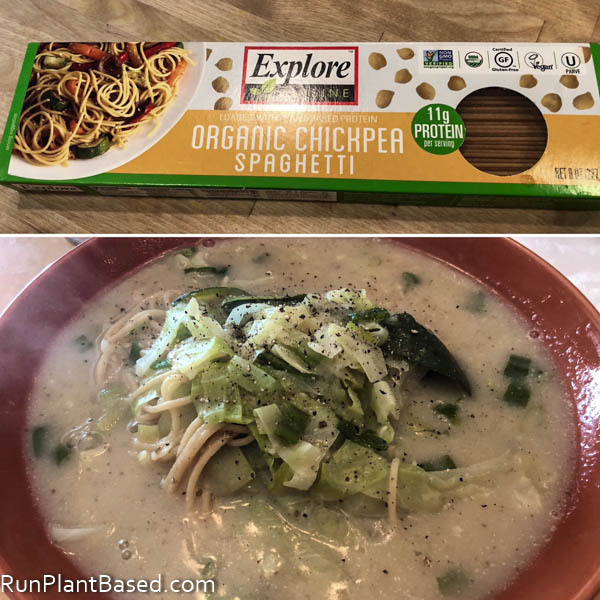 And I had a simple comfort noodle miso soup for dinner tonight using Explore Cuisine’s Organic Chickpea Spaghetti. And it was delicious, hit the comforting spot while we get ready for another work week. 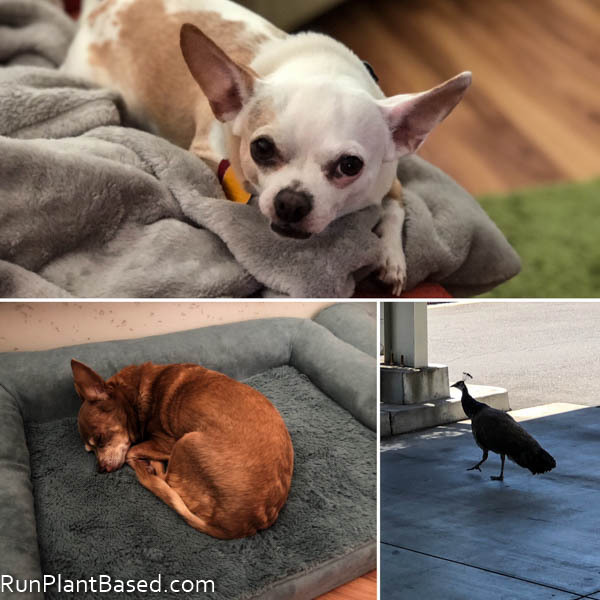 I have been a bit tired and lazy the last few days and I blame the heat and and maybe a little stress, so it’s been nice to take it a little easy this weekend getting stuff done and chilling with the pups in the AC. We watched A Quiet Place which was a great movie, creepy and intense. Okay, to the long list this week! This is pretty awesome, go Beyond Burger! Celebrity vegans thanks to What the Health documentary. This video sums up why beef is terrible for the environment. This vegan ultrarunner covered 310 miles in 8 days, wow. Here’s an interesting option to further reduce plastic use. 5 steps for improved running form. This man used running to lose a lot of weight. Going vegan cleared this woman’s skin condition. And gave this woman more energy. Vegan businesses are growing rapidly. Going vegan can make your skin glow. Leonardo DeCaprio is investing in more vegan businesses. This woman’s health journey is very inspirational. I can’t wait for this vegan egg alternative. This comedian reversed diabetes and cured sleep issues on a plant based diet. I feel your pain- A good mattress is one of the most important investments you can make, because there’s no replacement for a full night of sleep. I wish I could help but I’m in the same boat, and can’t afford anything to begin with! Keep us posted on your final choice. Very true and it’s a crazy world of mattress options. Going to need to make a spreadsheet, lol! Mattresses are vital! I loved the sound of that avocado vegan mattress, I contacted them to try to do a promo with me but got shut down. Oh well! They seem super nice though. And I love how there were peacocks outside the car service place, super cool! Agreed, really finding that as I get older. Bummer on the promo, that would have been awesome.